You’ve Calculated your CPAs, Now What? By now, you understand that your attribution model determines your CPA per ad platform. Improving your CPA per platform is a big factor in how you scale your marketing, but it isn’t a silver bullet for success. As you can see from the chart, Facebook has the lowest CPA. The logic seems simple here: you’d want to allocate most of your marketing budget towards Facebook ads. But what if most of the conversions generated from Facebook aren’t quality conversions? 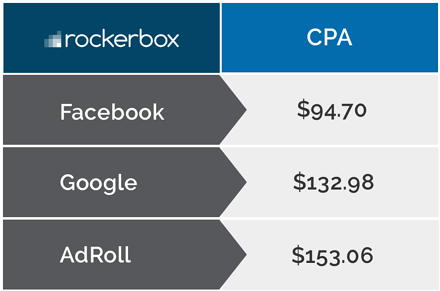 Consider Facebook and Google — Facebook has a CPA of $94.70 and ROAS of 200%. Google has a CPA of $132.98, but also a ROAS of 200%. If you focused too heavily on CPA, you would be tempted to bid down on Google, which would hurt your overall marketing performance. If you value all conversions equally, CPA is a very useful performance metric. But in many cases, especially in the world of ecommerce, there isn’t much consistency across conversion quality. Customers are valued differently depending on which products they purchase and in what quantities — making ROAS more valuable. Understanding CPA and ROAS goes beyond the world of advertising. Let’s say you’re using a few dating apps at the same time (e.g., Tinder and Hinge). After using several apps for a while, you find that Tinder gives you more matches than Hinge. This is because Hinge only connects you with people who you have mutual friends with on Facebook — making its candidate pool much smaller. Tinder has the better “CPA” — so you spend more time on Tinder. But after going on numerous Tinder dates, you find that they don’t lead to anything worthwhile. The bottom line here is that If you value all your dates equally, Tinder should be your app of choice. But if you value quality over quantity, it shouldn’t be. Scaling your marketing efforts isn’t limited to optimizing your CPAs and ROAS. After all, your ultimate goal is driving more sales for your offers. One of the best ways to do this is to acquire customers who’ll remain committed to your brand for many years to come. This is referred to as a lifetime value, or LTV. We’ll cover how this fits into the metrics mix later on, so stay tuned.